Peterborough rider Bradley Wilson-Dean is seeking financial support as he sets out on a GP adventure. The Panthers ace lines up in a qualifier at Abensberg, in Germany, on Monday. He faces a lengthy journey by road and expects the cost of the trip to be in the region of £1,000. Wilson-Dean said: “It’s a great opportunity to test my skills on the world stage and I’ll travel to Germany with the aim of qualifying for the next stage. “The trip won’t be a cheap one, though. It’s likely to total around £1,000 with insurance, fuel and travel costs. Peterborough have drafted in Kyle Newman, of Ipswich and Poole, to guest for Wilson-Dean in their SGB Championship KO Cup quarter-final trip to Scunthorpe on Sunday. 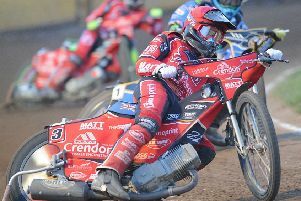 They are also without Jack Holder at the Eddie Wright Raceway as he’s involved in a World Under 21 Team Cup semi-final with Australia this weekend. The rider replacement facility will cover his absence.